The Corojo #5 line is Gran Habano’s strongest blend with its rich and complex wrapper. This line is available in a variety of sizes ranging from Churchill down to Lunch Break (Petite Corona) with 8 other sizes in between. 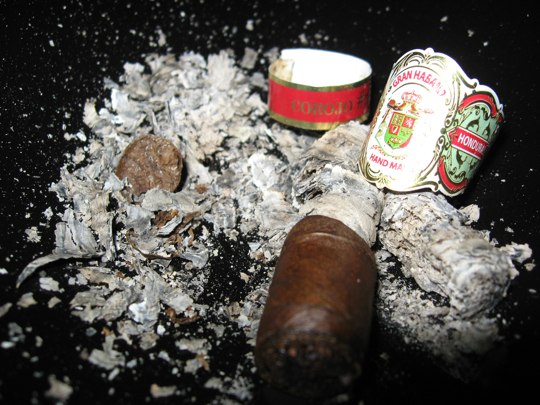 All offer a strong cigar full of flavor and spice. I found the Lunch Break to be a good intro to this line since the smaller vitola allowed the flavors of the wrapper to really shine through. 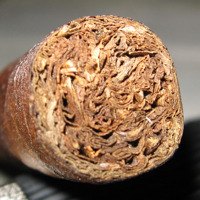 It is also a great price point for an everyday full strength cigar. •	About two inches in, flavor hasn’t changed much but it has balanced out. The cedar came through and the spice took a backseat, although still there. 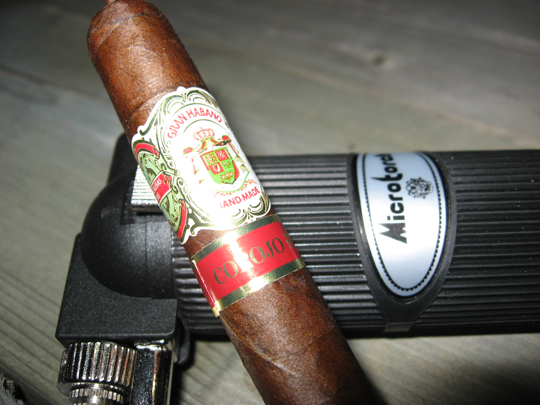 Minus the few burn problems this was a great little cigar, especially considering the amazing price point. 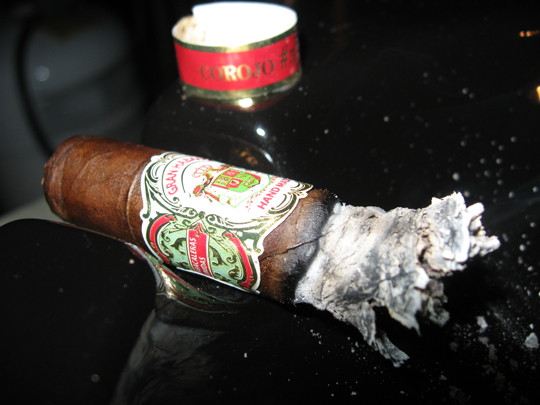 It offered a full bodied smoke with lots of flavor and spice to it. The variety of vitolas available will also satisfy any cigar enthusiast allowing them to choose their favorite. 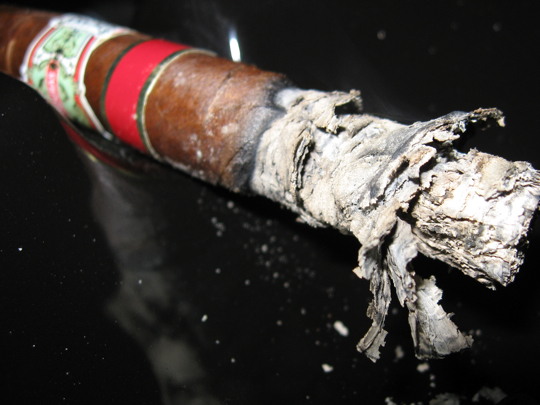 It surprised me that such a full bodied and inexpensive smoke had no harshness right down to the nub, even after re-lighting. The length of the burn time was also quite good for this vitola, coming in at 1.5 hours. The name might be a little misleading, I don’t get 1.5 hour lunch breaks! haha! I wouldn’t recommend this to novice cigar smokers as the body may be a little strong but would work very well as a mid-day or late day smoke for the veteran smoker. Definitely give this cigar a try, the peppery notes are not my favorite flavor profile but I did enjoy this particular blend as it wasn’t over powering and will be picking up more very soon. 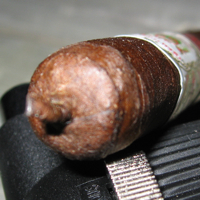 If you are also not a fan of peppery cigars, try a slightly larger ring guage which might bring the body down a bit. The beer I paired this with is a straight up Dark Lager, there’s nothing special to it and no flavors to it other than the normal malt/hop. It’s a decent no frills dark ale and fairly cheap. It’s also brewed very close to my house, about a 10min drive away and the only real local brewery to me. So although not my favorite dark beer, I like to support my local businesses and there’s something appealing to it’s straight forward flavoring at times. 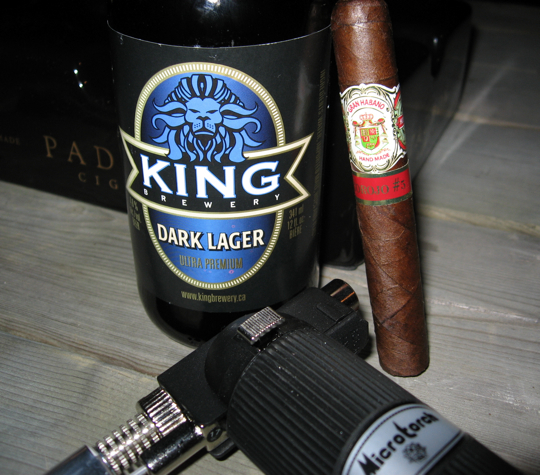 A dark beer paired fairly well with this cigar, some other choices for me would have been tawny port or scotch/cognac. 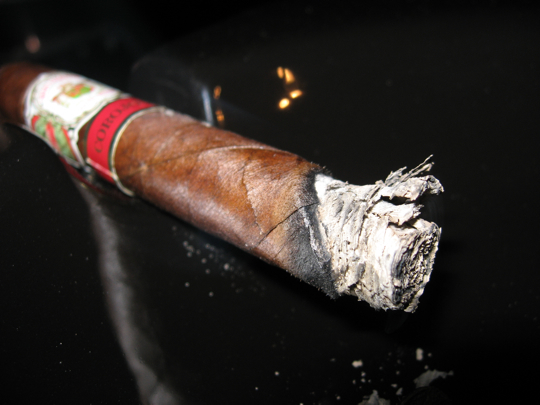 They would have been even better matches to the body and flavor or this cigar. Some strong coffee or sweet tea could have also made a good match. Once again great stuff. That ash looks wicked. I have yet to see these locally, I have seen them online before. Maybe one day i wll seek these out. My problem is you keep making my list way too long. Thanks for another excellent review. I have one of these sitting in my humidor. I’ll be sure to try it soon. Wow – a 1.5 hr petite corona sounds crazy! Sounds like a great stick for the money – nice review! Thanks for the review. I will be posting this on the GH website very soon!